I think I've only had pork belly once in my life but I can't think of where it was. I saw some at PCC last week and decided to get some, not knowing what I was going to do with it. This is the same cut of meat that bacon is made from. As you might imagine, it is a very fatty piece of meat. But don't let that scare you. Most of the fat melts while roasting and keeps the meat nice and juicy. Next time I get some I might try making my own bacon. I spent just a few minutes looking for a recipe online and came across Jamie Oliver's Pork Belly recipe. I followed it pretty closely. My belly was a little smaller than the one in his recipe so I reduced the cook time by a little. The only thing I didn't use from his recipe is celery. I even had some but forgot about it. 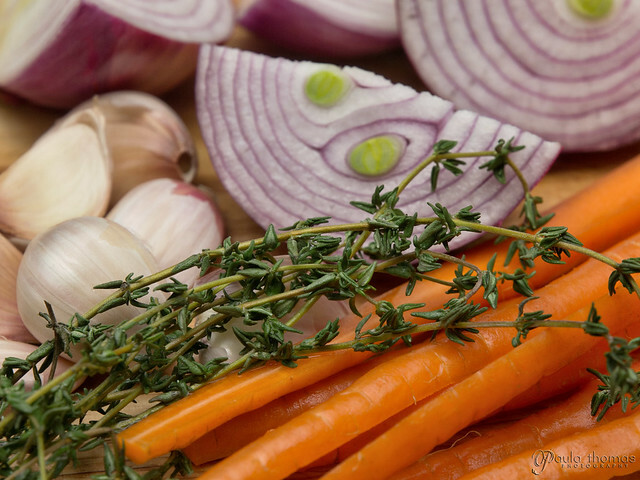 You can use any vegetables or fresh herbs you want and I'm sure it will turn out fine. It turned out nice and tender with a crispy crust on it. If it doesn't get crispy enough for you, you can always put it under the broiler for a few minutes. It's best fresh from the oven because you lose that crispy crust once it's refrigerated. Below is a slightly modified recipe to Jamie's. 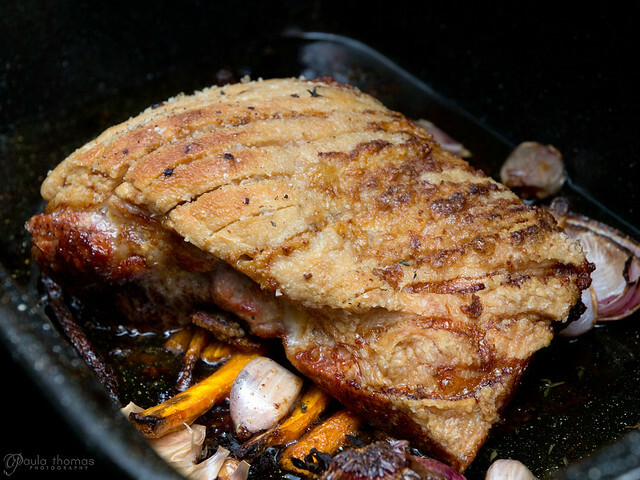 Place pork belly on a clean work surface, skin-side upwards. Make scores about 1/2 inch apart through the skin into the fat, but not so deep that you cut into the meat. Rub salt into all the scores, pulling the skin apart a little if you have to. Brush any excess salt off the surface of the skin and turn it over. Season the underside of the meat with a little more salt and black pepper. Place skin side-up in a roasting tray big enough to hold the pork and vegetables, and place in the hot oven. Roast for about half an hour until the skin of the pork has started to puff up and you can see it turning into crackling. Turn the heat down to 350 and roast for another hour. Take out of the oven and baste with the fat in the bottom of the tray. Carefully transfer pork to a chopping board. Add all the veg, garlic and thyme to the tray and stir them into the fat. Place the pork on top of the vegetables and place back in the oven. Roast for another hour. By this time the meat should be meltingly soft and tender. 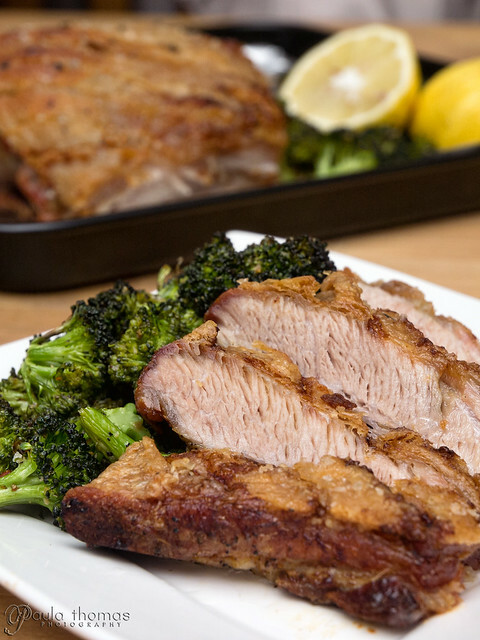 Carefully move the meat to a serving dish lined with aluminum foil and fold the ends up the sides of the pork but don't cover or you'll lose the crispy skin. Spoon away any fat in the tray, then add the water or stock and place the tray on the stove. Bring to a boil and simmer for a few minutes, stirring constantly with a wooden spoon to scrape up all brown tasty bits on the bottom of the tray. When you’ve got a nice, dark gravy, pour it through a sieve into a bowl or gravy boat, using your spoon to really push all the goodness of the veg through the sieve. Add a little more salt and pepper if it needs it. Serve the pork with the crackling topped with the gravy. Yours looks delicious! I was actually looking at the same recipe when trying to find out what to do with my porkbelly but when I saw Jamie's used the skin on I decided to do something else, as my pork belly came without the skin. Loved it though and will def try this recipe at some point too!